Trustee Quinn felt compelled to mock the Priest for raising his hand over head when giving a blessing, inviting a comparison to an actual Nazi salute seen below. 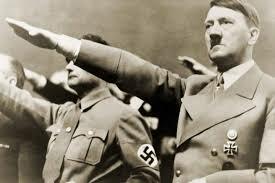 As one can clearly see the Nazi salute is an outstretched arm that does not rise above ones head. Anthony's lack of basic military history is an insult to members of the military. His tweet attributing a Nazi salute to a priest in a school setting giving a blessing is insulting to a school community and shows a breathtaking disrespect as a Catholic and as an elected Catholic trustee. The last time a Halton School Board Trustee made reference to Nazi's was in January 2011 when Board Chair Alice Anne LeMay was trying to defend another controversial policy to ban gay straight clubs and which ended up making the national news and embarrassing the Board nationally. At the time the alt-right trustees Danko and LeMay promised it would be the end of the catholic school system as we know it and that gay pride parades would break out at each school. The policy was reversed due to public pressure and as everyone knows seven years later the fear they were spreading has not happened. What's old is new again. It is the same with with the charity ban issue today - the alt-right trustee group spreads fear in the hopes of scaring everyone into accepting idiotic policies that are personally motivated. Anthony Quinn works for the advocacy group CARP (Canadian Association of Retired Persons) and knows about community relations and should know better than to make such easily avoidable mistakes. He needs to apologize to the church, the priest, the students, the school community and the good Catholics that elected him.